Looking for some easy yet creative Easter crafts to excite kids this season? Look no further than your very own homestead. You’ll find lots of kid-friendly crafts on this list that are made from upcycled materials you can source around your house. 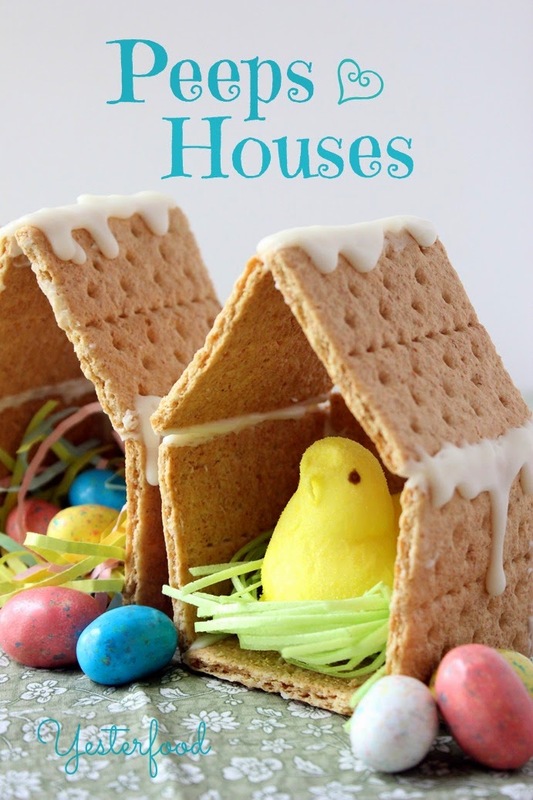 They are sure to become a great spring-welcoming project you and your kids can enjoy! Making crafts with my children is a major Easter tradition in our homestead. We love anything spring-related–lambs, chicks, and of course the more traditional themes of bunnies, baskets, and dyed eggs, among others. Celebrate Easter on your homestead with these magical and colorful spring-themed crafts from upcycled materials, perfect for the young and the young at heart. Spruce up any room for Easter festivities with this DIY paint chip Easter garland! It’s a thrifty and easy idea using paint sample cards all in pretty pastels, a short length string and a hole punch to make an Easter garland to fit a room of any size. I have seen a lot of toilet paper roll DIY, and I would say that it is one of the most versatile materials when it comes to crafting. 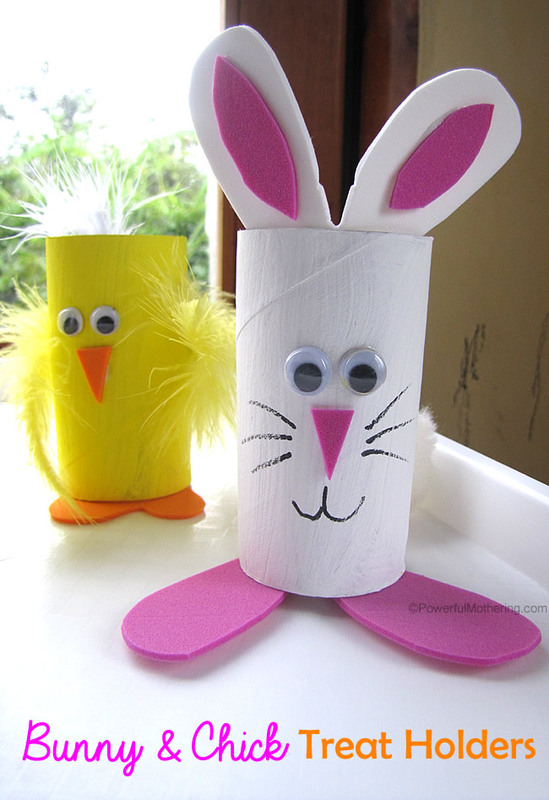 Just take a look at these toilet roll chicks and bunnies, who would have guessed that underneath the colorful paper and fabric is simply a cardboard roll? This project has unlimited possibilities as you can easily customize it with any fabric or paper of your choice. These mini wooden Easter baskets are the perfect project you can give to small children because it’s fun and very easy to make. Some of the materials do require a trip to the store, but the cost is minimal and everything is easy to find. If you’ve been searching for a craft that’ll suit your old wooden spoon, this is it! A wooden spoon definitely has its place in the craft room. 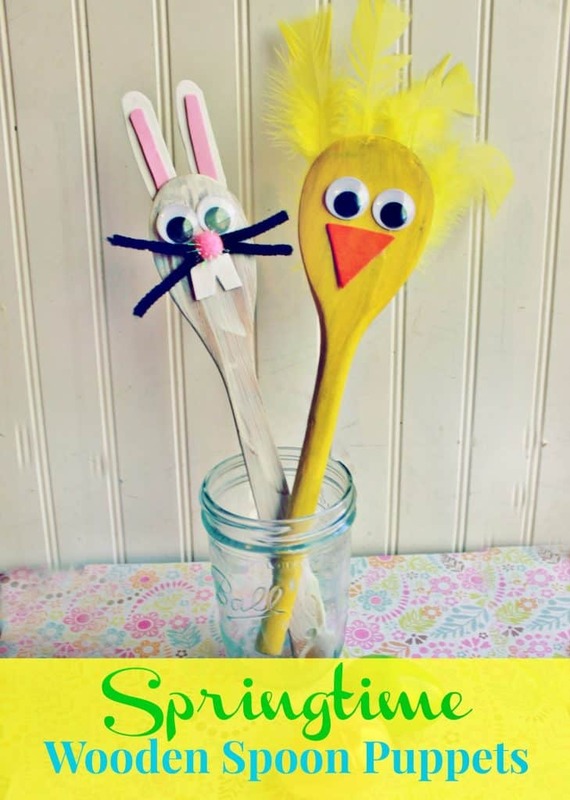 This wooden spoon chick puppet is a very simple project perfect for young children. All you need is some yellow paint, yellow feathers, orange craft foam, eyes, glue, and of course the wooden spoon. The idea so simple, I’m sure you’ve already figured it out just by looking at the photo. Then, after it dries, it will become a fun toy for little hands. 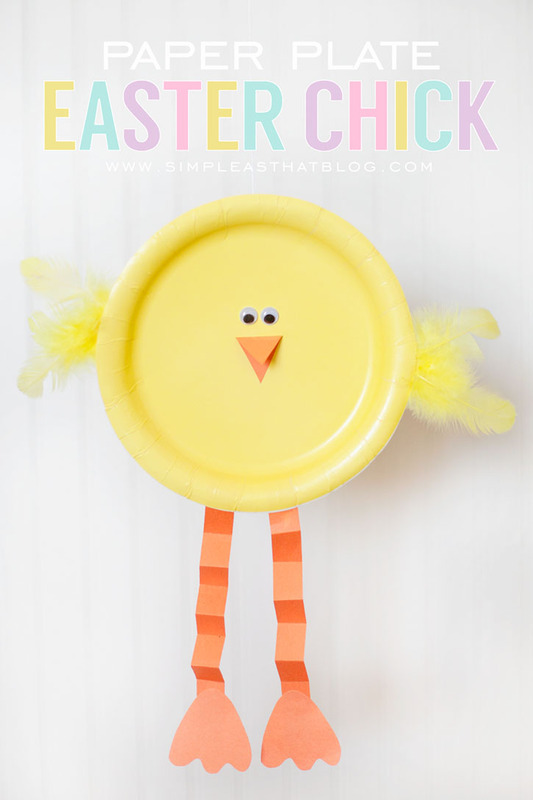 If you’re looking for the easiest craft for a toddler, this paper plate Easter chick will do the trick. Made with a paper plate, construction paper cut-outs for the beak and legs, feathers, and of course, those cute craft eyes, this is a project that’ll take less than 5 minutes! Envelope bunnies is an amazing Easter craft that is also perfect for giving as gifts. Fill it with some Easter candy and let your children bring them to school to give out to their friends and teachers as a wonderful surprise. Looking for a styling idea for the kid’s table this Easter lunch? This easy project will show you how you can create place cards with little bunny ears and names on them. They’re a fun and festive project that you can create just by yourself, or make use of your little helpers. Either way, you surely have an enjoyable time, and everyone will applaud your adorable Easter table setting! The idea is putting together the shape of an egg and a bunny is simple yet adorably cute. This charming yarn bunny is made of white fuzzy yarn, Styrofoam egg, and basic crafting supplies. The step-by-step easy-to-follow tutorial will lead through the creative procedure so that you and your kid will surely have a great time crafting. Pine cones are naturally egg-formed, which makes them perfect for your kids to paint. Take a hike around the homestead and gather some! Hide them as Easter eggs and come hunting time I’m sure you’re going fool a couple of hunters because they can camouflage into your landscape. The kids will have fun crafting these adorable fuzzy bunny masks, and I bet they’ll enjoy wearing them even more! Don’t forget for snap some photos while they are making them and of course, once they’re wearing them. These are the perfect props for your fun family photo op this Easter! Looking for an easy low-cost Easter decoration? 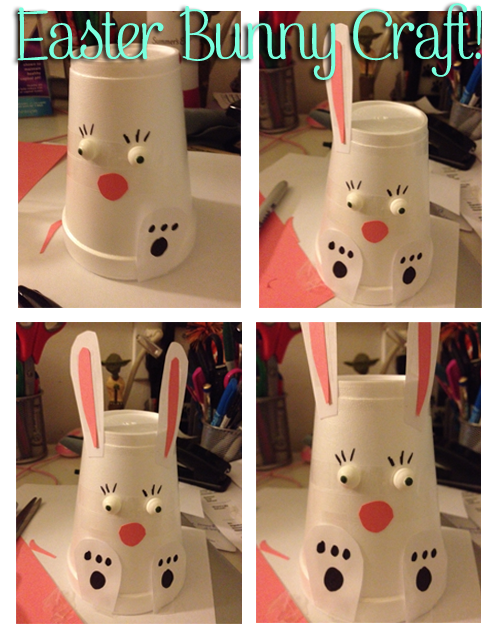 This paper cup bunny is the answer! Made of inexpensive, readily available crafting supplies, and easy enough for the young ones to follow along to, this Easter craft and decor will be a hit in the homestead this year. 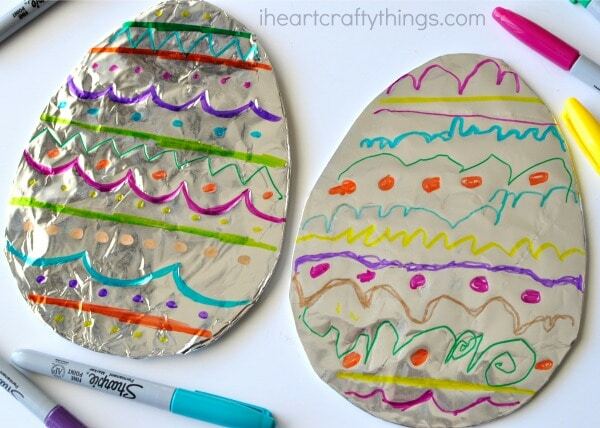 Let your child’s creativity shine through by letting him or her decorate some tin foil Easter eggs. Made using different colored Sharpies, cardboard, and foil, sometimes the simplest ideas make the most beautiful results. These DIY daffodils will surely brighten up your home for Easter or any spring day. Make a couple with your kiddos and ensure a spring-tacular decoration that you’ll be proud of. The spring colors of this easy paper Easter wreath will spruce up your home in time for your Easter celebration and yet the materials used are less than $5. That’s major bang for your buck, not to mention the joy you’ll have making a wreath with your kids is priceless. A tree is not just for Christmas, it’s also great for Easter. I’m sure, If you’re a fan of both the Easter holiday and of trees, you’ll love to have this festive Easter egg tree in your home. Don’t worry about the supplies, because everything is available at your local dollar store. Here’s another thrifty craft with a pine cone. 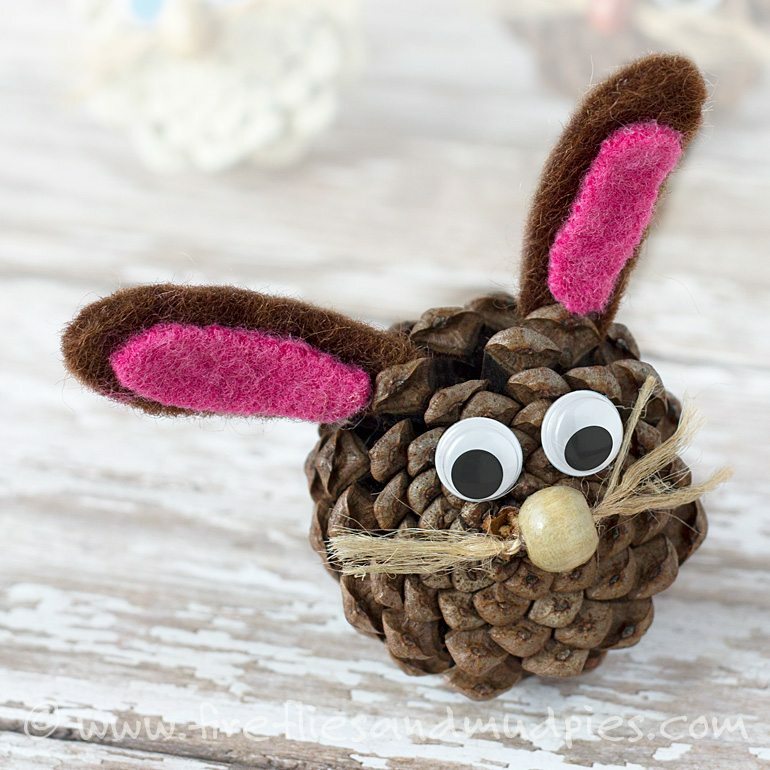 These pinecone bunnies transform your ordinary backyard pine cones into the cutest Easter bunnies. Gingerbread may be a Christmas staple, but aren’t these peeps houses too adorable? They sure to be a hit at your Easter celebration. Make Easter candy even sweeter by putting them in these easy Easter candy jars. It’s the perfect hostess gift or party favor that’ll surely tickle your recipient! These wonderful Easter egg buttons will let your kids have all the fun adding some Easter cheer into their room. Gather all your old buttons and let your kids transform them into a colorful Easter egg. Looking for the cutest Easter costume for kids? 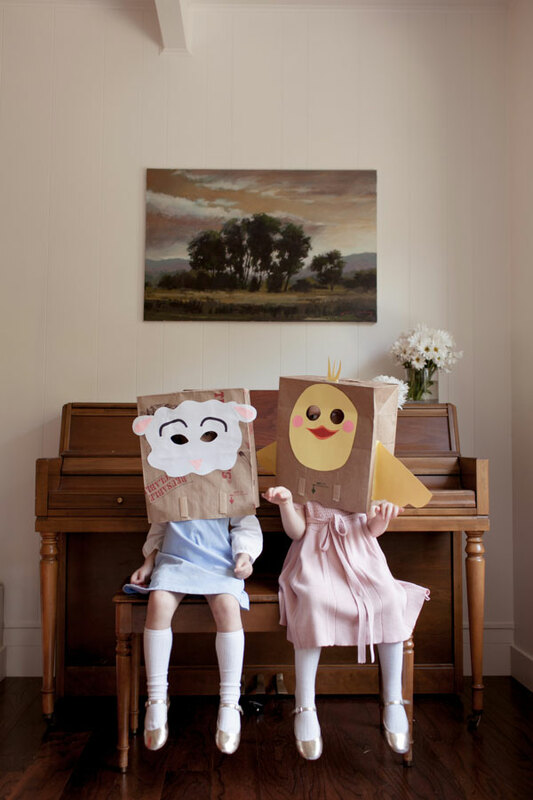 This thrifty brown sack Easter mask is Easter-rifically perfect. It will instantly transform you child into an Easter animal of their liking! Spring is a celebration of beautiful colors. 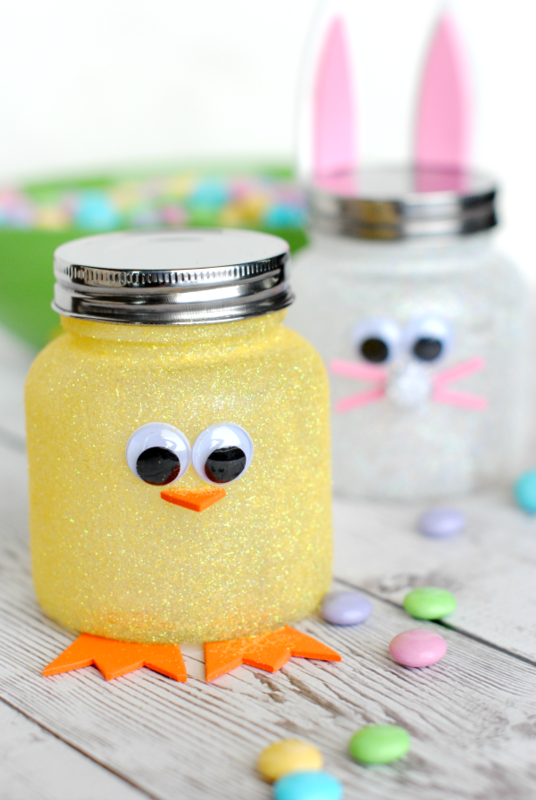 So, let your kids color some of your mason jars and transform them into eye-catching Easter egg mason jars to display in your house and celebrate the season. 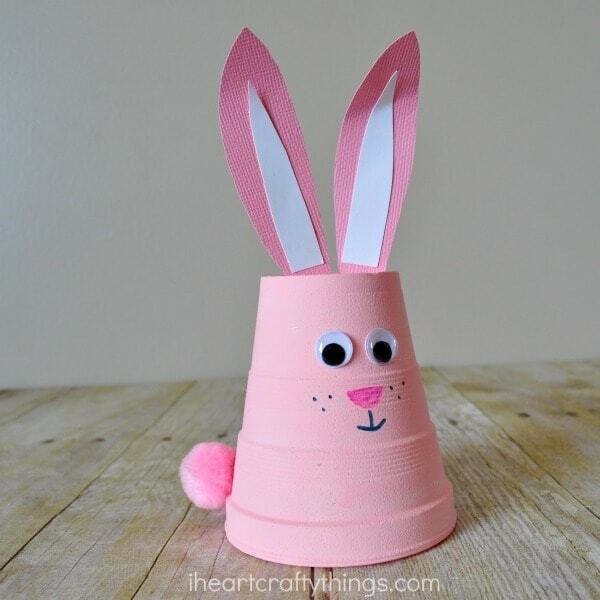 This adorable pink foam cup bunny is easy and fun for kids to make and will look lovely in any corner of the house this spring. If you love pink, just like me, be sure to have extra supplies ready because you’re going to want to make a lot of these! I’m guessing you already have all the supplies necessary to help your child make these adorable Easter bunnies. 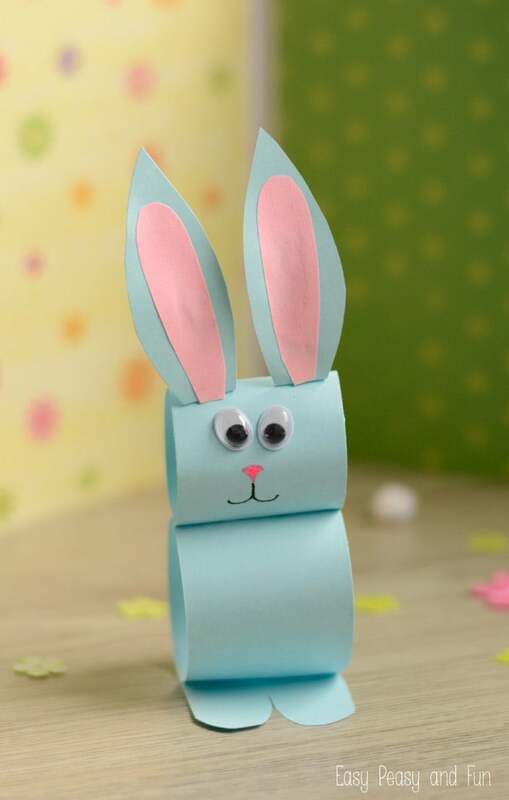 So, gather your supplies, sit down with your kids, and spend quality time crafting this paper bunny craft. Want to teach your young artist about minimalism? Then, this paper strip Easter Egg art is the perfect craft to get them started. Just let your young artist arrange some strips of beautifully hued paper then you’ll have Easter art you’ll proudly display on your wall. I love chalkboard paint! How I wish we already had some back when I was a kid, but no matter, I have some now! And with it, the crafting possibilities are endless. These chalkboard paint eggs are just one of the many crafts where young ones can truly practice their creativity. They can create designs as intricate as they want them to be. This project is perfect for everyone in the house. That’s all for now, my fellow homesteaders! I hope you celebrate your Easter holiday trying a few of these fun Easter crafts and have the most unforgettable time ever as you spend some precious time with your young ones! Enjoy crafting! Which of these Easter crafts is your favorite? Mine is #25 and I’ll definitely be making them this season! Will you do too? Let us know in the comments section below? Want another spring craft to put your creativity on? Here’s How To Make DIY Rainbow Roses | Perfect Flower Idea For Spring! I’m sure your homestead will be as lovely as ever with these DIY rainbow roses.